I was in luck. I got home about an hour after the Battle for Azeroth went live in my time zone and was able to log straight in and get started. No queue, not hangups, nothing wrong. And the game wasted no time either. New things were immediately presented. I’ll tell you what’s new! 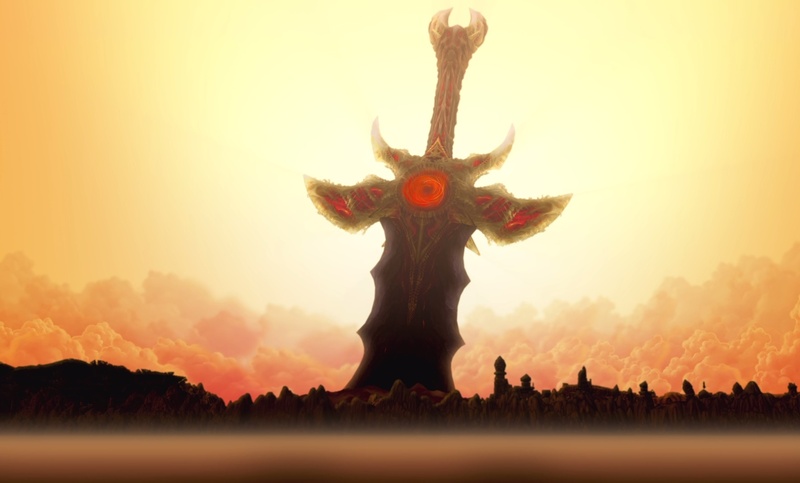 It was pretty much straight off to Silithus to finish up what we started back at the beginning of the pre-expansion events with Mangi Bronzebeard and the great big sword in the middle of the zone. 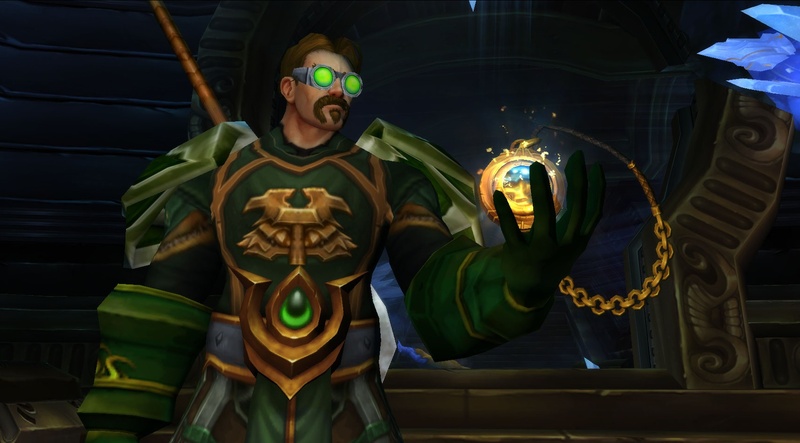 We did a few things, said good-bye to Illidan Stormrage, and went through the azurite intro which included me being handed a genuine reproduction of the Heart of Azeroth, a neck piece that lets you do the azurite thing. A bit of instruction, my first bit of azurite capable gear, a flash back through how that sword got stuck in Silithus, and things were wrapped up. 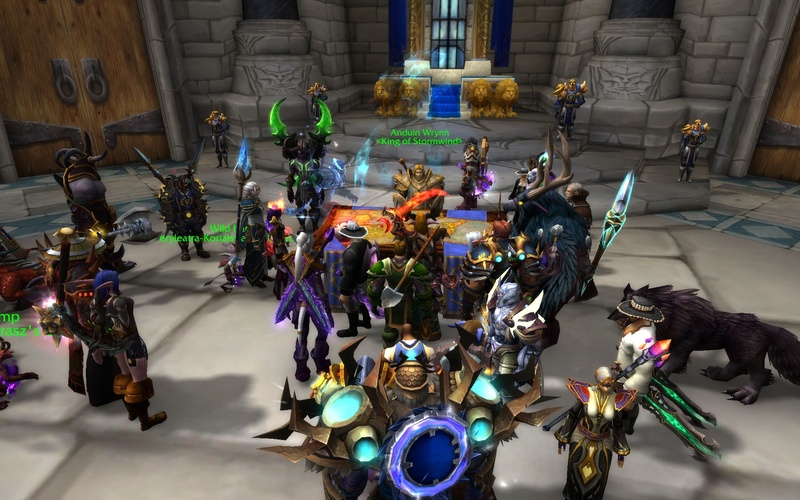 Then it was back to Stormwind for a quick meeting with King Anduin Wrynn and… well… anybody else who happened to wander into the room for that part of the question. Andiun and his advisors are concerned with word that Sylvanas is off to seek allies in Zandalar. If the Horde manages that it will lead to a naval ally gap. The Alliance needs their own allies in that regard, so I was sent off to meet Jaina at the dock. She has a spiffy new boat. Somehow I managed to fall off the boat almost immediately. Apparently there is a no flying mount zone around the boat, so my mount disappeared right above the gap between the dock and the boat. 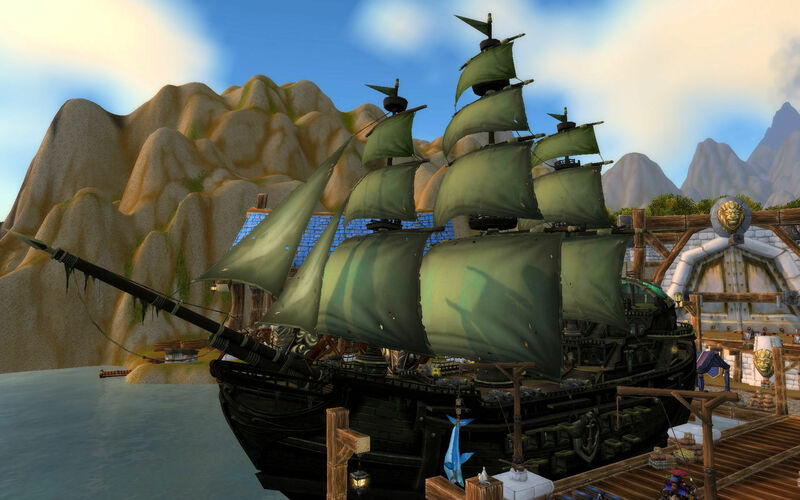 Fortunately there was a ramp pretty close to hand and I was able to get out of the water and on to the boat with Jaina, at which point we sailed to Kul Tiras. 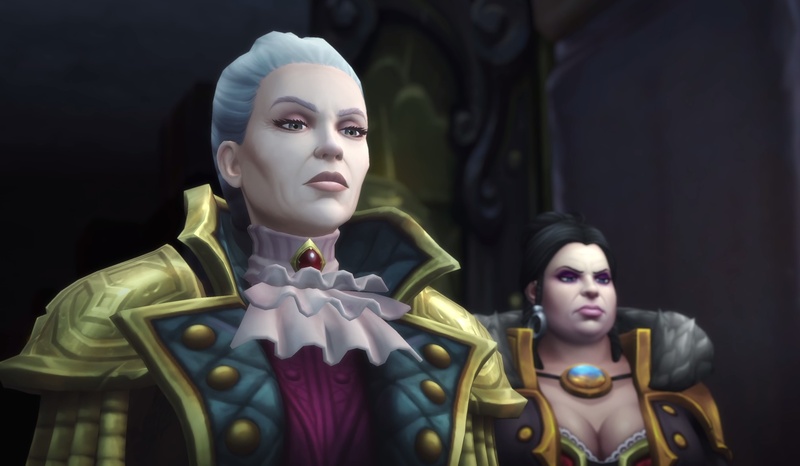 On arrival I immediately began to regret that I hadn’t paid more attention to the lore around Jaina and the Proudmoore family. She was not welcomed with open arms. Her mother runs Kul Tiras and blames her for the defeat at Theramore and the death of her father, so things were more than a bit awkward. Jaina was hauled off and I was thrown in jail. 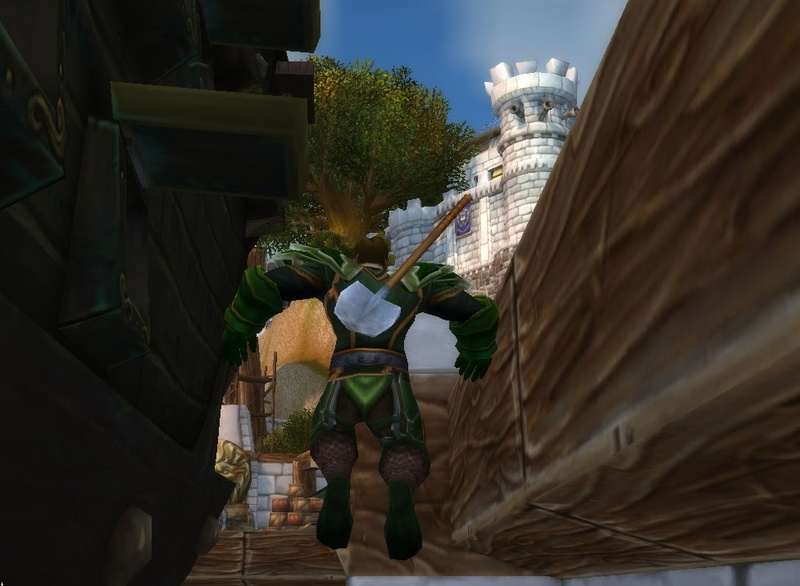 But, as we know from all RPGs through all time, the hero breaking out of jail is super easy, barely an inconvenience, so I was out and free in short order and headed off to Boralus Harbor with a bit of exposition along the way. From there it was a tour about town, a couple of tasks to get me acquainted, and then off to the familiar from Legion decision as to which zone to go after first. Only three zones? You have a couple hidden here for later, right? 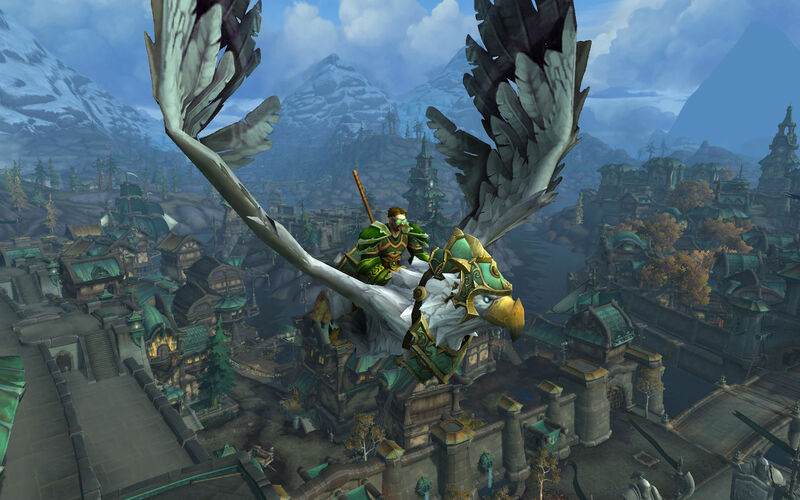 I went with Tiragarde Sound which, in its description, held the promise of getting in better airs with Jaina’s mother Katherine, which seemed important given recent events. While there is no jail in Azeroth that can hold me it seems, I’d still like to move pas all that. So off I went to get stuck into my first zone of the expansion. At this point I want to stop for a moment and praise the new areas. 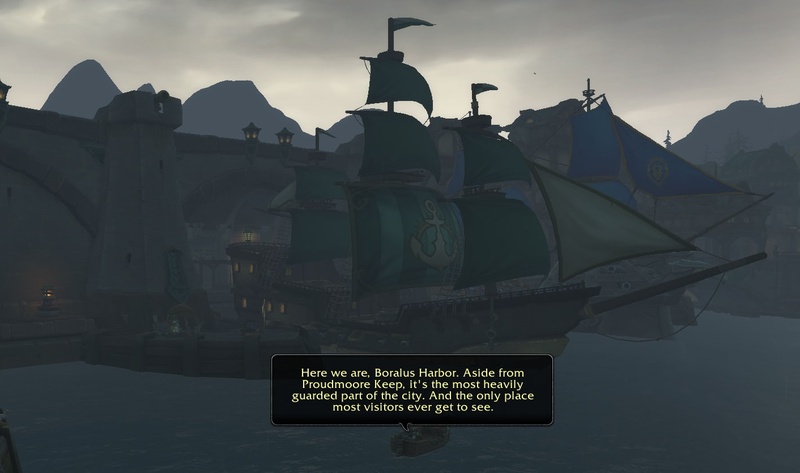 While I have adopted a flippant tone, I do have to say that walking about Boralus Harbor really impressed me. It is a beautiful, detailed zone that feels like part of Azeroth yet not a place I have been before. It certainly isn’t another trip back to Dalaran. It has a very organic, seaside town feel to it. 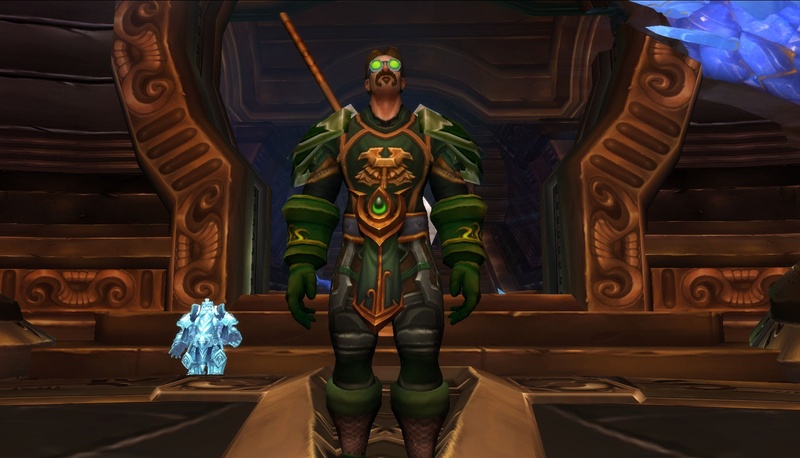 Also, the main color scheme is in greens, so I clearly chose the right transmog to wear. I just tell everybody the shovel is an oar and I am set. So first impressions are pretty positive. I had to stop playing to take care of some things around the house… and then to write this… but I really want to get back and carry on. I am kind of amused that several sites out there have guides up about getting to level 120 as fast as possible. While I am often a destination guy, there is some journey here to enjoy. I don’t have to race with this guy. Four and a half hours and he’s through. Now what? Do you start working on alts then or just badger your guild mates to hurry and catch up? This entry was posted in entertainment, World of Warcraft and tagged Battle for Azeroth, Boralus Harbor, Kul Tiras on August 14, 2018 by Wilhelm Arcturus. I played the beta and enjoyed it. The only downside with the full release is I have to double check my build and abilities as they reset the talent tree. A quick visit to Icy Veins and I was back in operation. The new areas are lovely with lots of detail. There has also been a slight improvement in graphics. I also notice there is no full screen option anymore but it isn’t a big deal for me as I always use full borderless so I can quickly alt-tab to my browser and Discord. I have also activated the new War Mode to get the new bonus experience and quest rewards. That will be interesting to see what happens. I’ve not yet been attacked but I am playing a protection warrior so it is only a matter of time. Doesn’t worry me though and I am looking forward to some world PvP. As for the pace of the game I am taking it easy and am in no rush to reach level cap. I am concentrating on reading and listening to all the quest stories as I have read Blizzard as done a really good job with that in this expansion. So far the world building is very impressive and the starter town looks great. I watched my GF doing the starter quests. 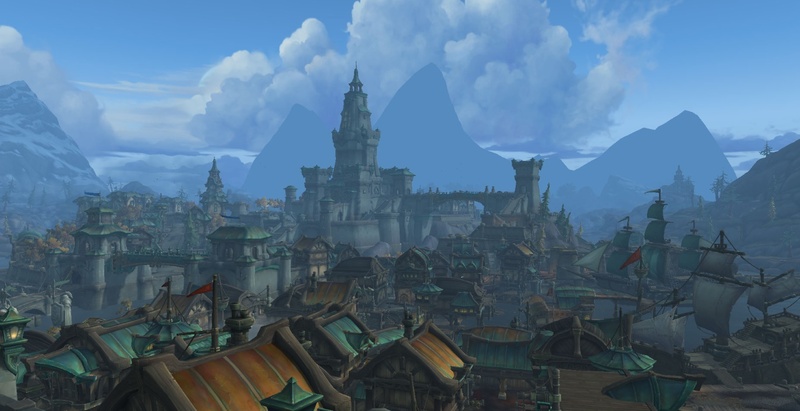 It’s weird that everyone in the blogosphere went to Kul Tiras, while she went to Zandalar. Everyone is alliance recently? Anyway, watching her and reading you I have full Warcraft experience without paying a dime or having to do the clicks myself. @Gevlon – You’ll likely see more here about the Horde side with this expansion. Up until now playing Horde hasn’t given you a different experience. 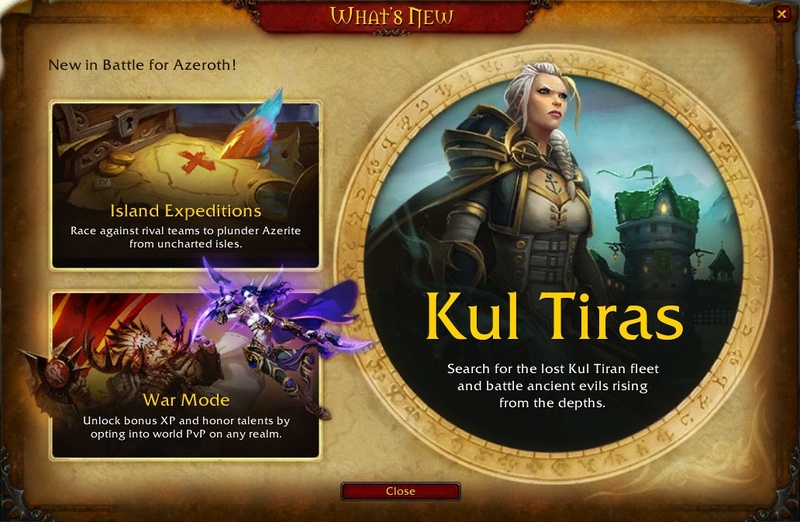 You have had different flight points or bases, but you end up following the same story and doing the same quests as both Horde and Alliance, so why bother doing an alt from the other faction? Even back in vanilla everything merged in STV and followed the same path. 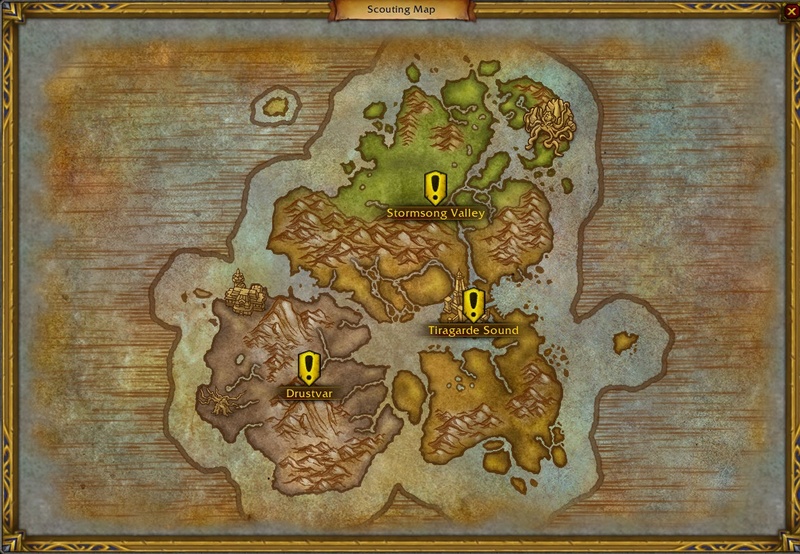 This time around, at least at first glance, Horde and Alliance have their own set of zones, three each, so the play through ought to be different enough to make running the other faction worthwhile this time. My plan is to play both sides. We’ll see. So as a horde player I’ve chosen to sit this one out for the time being. It’s weird to get hung up on a games story but sylvanus has done some truly evil stuff lately and I’ve never played my Tauren druid as a villain in mind so I won’t be playing him. Not sure if that changes if she ends up being made the big bad)(which really they just did that in MOP) and even then I would still have to play through a quest line that at least tacitly supports her action. The whole burning of the world tree irks me because no druid no matter horde or alliance would follow her after that, but we are forced to by the quests so yeah, may just be skipping my first Wow expansion.